Philadelphia Inquirer's columnist Rob Watson is a bit worried over the recently announced Prestige Edition of Call of Duty: Modern Warfare 2. Why is he worried? Well he thinks that while 99.9% of the "kids" that own it will have harmless fun with the NV goggles, it's that .1% that'll ruin it for the rest of the folks. Yet, it is also like giving away a free race car with Gran Tourismo or Forza - someone is going to cause a highway wreck. In Modern Warfare 2's case, I shudder (just a bit) to think of someone, who may have a hard time with reality anyway, donning these goggles for real mischief or even worse. Infinity Ward should know better. They are great at fake realism. One of the best. This maybe be crossing that line, however. I'm not so sure that comparison is accurate though, to be honest. It's a lot easier to hurt other people with a 2000 pound piece of metal that goes 175MPH than a plastic pair of goggles that let you see in green. One thing I think that would be really cool - and I'm not even sure if it's technically possible - would be to use the goggles with the game. 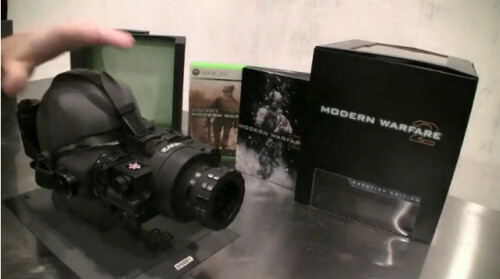 The way it would work is there would be special or secret locations in the game that using the night vision goggles would reveal content or engage the player more with the game world. It's really no different than all the plastic accessories for the Wii-motes, but the NV goggles will give you real world benefits. Just hopefully not mischievous ones.